My heart is still heavy for all that is happening in #Ferguson, as I’m sure yours is. The death of Mike Brown continues to reveal both ugly scars from our racial history as well as some beautifully redemptive stories of hope, reconciliation and unity. There is another story of justice/injustice that continues to unfold, and it is one that should also be at the front of all of our minds. It’s another excruciating case of the system breaking down, and there is a very real mom who is facing life in jail for doing little more than intelligently defending herself and her children. 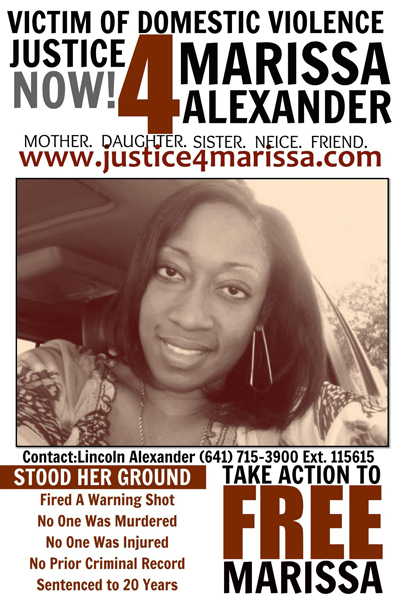 Marissa Alexander is an African American mother of three who is a repeated survivor of domestic violence, including being choked in front of her two teenage boys. And this is not a case of he-said, she-said (not that the seriousness of domestic abuse should be diminished, even if it was). Marissa’s estranged husband, Rico Gray, has been arrested for domestic violence twice, and Marissa has ended up in the hospital with documented injuries. He is an abuser with a proven track record of violence, and domestic abuse is one of the scarest and least talked about forms of evil in our society. On August 2, 2010, only days after giving birth to her premature child, Marissa says that her husband went into a rage and tried to strangle her. She fled the family home and ran for the garage, but in her panic realized she forgot the keys. He was still inside the house, and was still claiming that he was going to kill her, and she didn’t know what to do to best protect herself and her children. Marissa is a registered gun user (and an MBA, as an aside), and she decided to grab the gun as a means to keep her violent husband away. When he approached her she did something that seems to make absolute sense for what she was facing: she fired a warning shot into the ceiling, and told him to back away. She didn’t even shoot at him. She just fired a warning shot in the ceiling, so that she and her children could escape a dangerous situation. This is the part where it gets crazy. Marissa was arrested for aggravated assault for firing the gun, while Rico was not charged with anything. She was then offered a 3-year plea bargain but understandably rejected it – what had she done that was wrong, other than defend herself against a proven abuser? It seemed crazy that she would have to consider doing time for firing a warning shot. Once it came to trial, she used the “Stand Your Ground” law as her defense, which also makes a lot of sense.After all, if George Zimmerman could be acquitted under this law because he claimed fear for his life, then how much clearer should it be if a documented abuser was threatening the life of Marissa? But in a cruel twist of fate, the law was not found to apply to her case, and Marissa was given a 20-year prison sentence. Let that sink in: 20 years in prison for a mother who fired a warning shot to keep her abusive husband away. Most analysts agree that even though she showed both good judgment and mercy by firing a shot into the ceiling (as opposed to actually shooting him), it actually weakened her case. With “Stand Your Ground,” her legal case would have been infinitely stronger if she would have shot and killed him. Let that sink in as well. There are some instances that happen where sides form and each side has a different perspective on what happened and how it should be treated. But what could possibly be the rationale for putting a well respected mother of three in jail for 20 years? She has absolutely no criminal record in the past. She had been abused repeatedly and it was documented. She was a registered gun owner, and used it only for the purpose of creating space between she and an abuser. How many times have we seen some version of this – where the defendant felt threatened by someone (often times for reasons that seem shady), and then shot and killed that person in self defense? And how many times has that defendant then walked free? With that as our current reality, how can we possibly make sense of a mom who intentionally avoided harm to the abuser by firing a warning shot, only to be sentenced to 20 years in jail? It’s as heartbreaking as it is foolish. There are a series of us who joined up with Thirty Seconds or Less, a blog that invites a chorus of voices to speak into current social issues in literally 30 seconds or less. It’s a great site, and you can hear my 30-second blog on it here. But really, I’m hoping you will give it more than 30 seconds worth of attention. I’m hoping you’ll familiarize yourself with the case, and speak out about the crazy inconsistency and injustice of it all. A great place to start is the Free Marissa Now page. There is also a great overview of the story, and lots of links, on the great blog of By Their Strange Fruit. You can also see some helpful CNN commentary here. OMGosh! Speechless. Thanks for letting us know.